From a reviewer's perspective, hi-fi components can be a tad opaque, metaphorically, if not literally. It can be hard to tell where they come from, or what they're intended to achieve that is not already available, perhaps from a multiplicity of sources. Or it may be that the products are so literal in the way they 'interpret' music, that it is hard to tell where the notes stop and their musical meaning begins. The other side of this coin is that there are components which are so obvious in what they are attempting to achieve, that they present the reviewer few, if any, problems in understanding them. Here we have two components that have just this quality. The complete range is called Armonia (the word translates as harmony), which is the new entry-level offering from the house of Audio Analogue. While the Crescendo CD player appears to have no direct predecessor, the amplifier is in a direct line of descent from a much earlier and well-liked model called the Puccini. Audio Analogue is better known for more ambitious and more costly designs, but the Crescendo amplifier and CD player seem purpose-designed for our strained economic circumstances and cost just £599 apiece. Surprisingly, perhaps, unlike most other components around this price level, they are made in Italy and not under contract in the far east. In fact they come from a factory between Pisa and Florence in Tuscany. We should add that there is nothing wrong with being made in the far east – which these days is where the majority of the best known names source their mainstream products – but this doesn't alter the fact that there is a certain cachet in bearing the 'Made in Italy' badge. 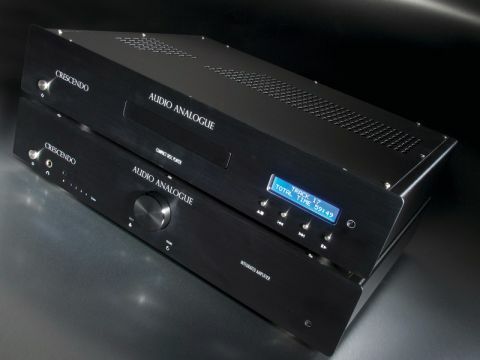 The first tranche of models under the Armonia banner include the two products tested here, a CD player and an integrated amplifier, as well as a slightly offbeat component called the crescendo tuner/USB DAC, which started life as an FM/AM tuner and which also includes a USB digital to analogue converter stage designed to be connected to a PC. There is nothing special about the presentation of either component. They're neatly built from alloy panels, with aluminium fascias, but neither could be described as heavyweights. The amplifier is rated at 50 watts into eight ohms and 80 watts into four ohms, so it's no power house either, but on paper and in practice, it is adequate for use with medium sensitivity speakers (86dB/watt or more) in relatively compact surroundings. The five identical rear panel inputs are all at line level, but in addition there is a front input (via a 3.5mm mini-jack socket), which can be used to make temporary connections from the line or earphone output of an iPod or other personal player. A tape deck is also accommodated. Adjacent to the front panel input is also a standard 6.3mm headphone socket. The CD player is designed for CD and the familiar recordable variants – CD-R and CDRW – and the decoded audio is available at line-level from a standard phono pair on the back panel, though the unit will also supply digital audio from an S/PDIF output. It took little time, other than the obligatory hour or so powered-up, for the character of the two components to clearly assert themselves. Of the two, it is the amplifier that dominates here. As expected, the CD player also works impressively well, but it is clearly the less distinctive. A fluid, valve-like sound is a key part of the Audio Analogue ethos, but the price precludes use of thermionic valves in a mainstream unit like the Crescendo amplifier. This is the reason why it is solid-state, but it is no surprise that it has more than a hint of the aural qualities of a valve amplifier. To put it at its simplest, the Crescendo is warm, expansive and, at times, even a bit luxuriant, which with many types of music material works really well. It is capable of going moderately loud, but not excessively so. Pushing the volume up in a largish room through Mordaunt-Short Performance 6LEs shows that, while the sound has real composure up to a point, the treble is brittle and edgy above 92dB SPL and the sound eventually becomes edgy through the midband too, as the overall volume level is raised further. The bass always sounds generous, but it is not completely even as the volume is wound up high. The upper bass becomes excessively warm under pressure, and although bass depth is quite impressive, there is never the feeling of even power delivery and authority that a bigger more ambitious amplifier can deliver. But somehow it remains relaxed and easy on the ear. We even found some ideal examples of source material to show the Crescendo amplifier's real strength: one particularly strong example being an SACD recording of Bruckner's 7th Symphony (specifically Mariss Jansons/Symphonieorchester on the BR Klassik label), which sounds nothing less than glorious; the richly melodic strings and woodwind being particularly impressive. The crescendo renders the architecture of the music with real swagger and passion. The effect was less convincing with some other types of music, not least (to pick another example from the listening sessions) some of the exquisite orchestral miniatures from Takemitsu, which are very rich in high frequencies. Harmonics still sound good, but where the amplifier appeared to 'sit' on the sound, it was certainly denied, full expression. On the other hand, vocal material generally works very well. The two Crescendo components have what can best be described as great singing voices and are more than capable of expressing the passion of great choral and solo writing, such as Verdi's Requiem (orchestra e coro dell'Accademia Nazionale di Santa Cecilia, conductor Antonio Pappano) which is brought to life in a sometimes startlingly and vivid way. Despite the earlier comment to the effect that the Crescendo amplifier is the more obviously distinctive component of the two, the CD player turns out to be surprisingly strong. Although it lacks the obvious tonal warmth of the amplifier, it has much of the same sense of grace, which is something of a house quality. The only obvious negative we could detect, is that the pairing isn't completely compelling when reproducing the more popular and mainstream music available for this test. The two products seem almost purpose-designed for orchestral, chamber, jazz and vocal music, while mainstream rock and pop material played at high levels sounded slightly flat and short-changed. The two components do little to disguise inadequate recordings. But our enthusiasm for these two remains undimmed and, subject to the system and music-related caveats expressed above, I can think of no similarly priced paring which is as musically persuasive and convincing.